At their most basic level, refrigerants (also sometimes called coolants) are the chemicals needed to produce cold air. Simply put, you wouldn't have air conditioning without the refrigerant inside your air conditioner's coils. Different types of refrigerants have been used for cooling homes throughout modern history. The preferred compounds change as we discover newer and more efficient ways to complete the refrigeration cycle, as new chemicals are developed and as our understanding around the environmental impacts of these coolants expands. In fact, we're in the midst of a change again: The phase out of R-22 to more environmentally friendly and affordable alternatives. To understand why alternative refrigerants are needed, it's helpful to dive a bit deeper into the history of refrigerants, including how they work and the different types. When used with a component like your air conditioner's compressor, refrigerants absorb heat from the environment — like the warm air inside your home. This process is known as the refrigeration cycle. As the refrigerant absorbs heat from your home's indoor air it changes from a low pressure gas into a high pressure liquid. Then, the refrigerant is sent outside. A fan blows hot air over the unit's copper or aluminum coils before exhausting that same hot air to the exterior of your home (you obviously don't want that hot air in your house). As the refrigerant cools down it transitions back into a low pressure gas. Finally, a fan inside your home blows air over the cooled coils to distribute the (now cooled) air throughout your home. The cycle repeats until your home reaches the temperature you've set on your thermostat. You may have heard about chlorofluorocarbons (CFCs) — they've been used in aerosol sprays, as blowing agents for foams and packing materials, as solvents and also as refrigerants. In the late 1800s and early 1900s, toxic gases like ammonia, methyl chloride, and sulfur dioxide were used as refrigerants. After several fatal accidents involving methyl chloride in refrigerators in the 1920s, Frigidaire, General Motors and DuPont set out to find a safer alternative. 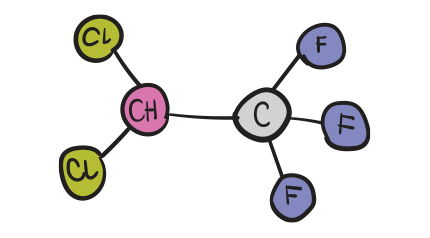 This search led to CFCs, which were first created in the late 1920s. Frigidaire got the first patent for the formula, but by 1930 General Motors and DuPont were producing Freon® (DuPont's registered name for the CFCs they produced), a name you're likely familiar with. By the 1930s Freon®-11 (or CFC-11) was being used in the world's first self-contained home air conditioner. Freon®'s reputation as a safe and non-toxic coolant led to its widespread use in homes throughout the 1950s and 1960s. CFCs are safe to use most of the time, but the 1970s led to another discovery: CFCs react differently in the Earth's stratosphere, or upper atmosphere. That's because chlorofluorocarbons contain chlorine, which is highly reactive with ozone. Ozone is a form of oxygen, but not the type that we breathe. When chlorine molecules meet with oxygen molecules, ozone molecules are turned into run-of-the-mill oxygen molecules, and the ozone layer becomes damaged as a result. We'll spare you the rest of the science, but the gist of this new information was that CFCs resulted in a loss of stratospheric ozone and an increase in the greenhouse gas effect. We need ozone — it's a trace gas that absorbs harmful ultraviolet radiation and protects plants and animals from biological damage. That's why 43 countries signed a global environmental treaty, the Montreal Protocol to Reduce Substances that Deplete the Ozone Layer, in 1987. As a result, production of Freon® and other CFCs was reduced dramatically, with all production stopping by 1994. This led to the usage of our next type of coolants: Hydrochlorofluorocarbons (HCFCs). With CFCs being phased out, we needed an alternative. By the early 1980s companies like DuPont were creating alternate compounds with fewer environmental dangers, including Hydrochlorofluorocarbons, or HCFCs. Freon®-22, or R-22, was one of these compounds and it was found to be slightly less damaging to the ozone than R-12. 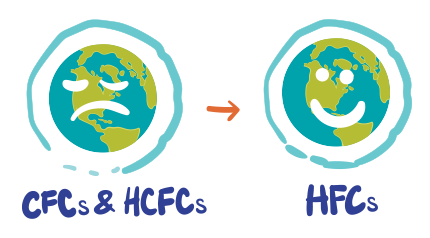 Because HCFCs have a hydrogen atom, the harmful chemicals decompose before they reach the Earth's upper atmosphere. Since they don't have any chlorine atoms, they don't attack the ozone layer. Further, they only "survive" for 2 to 40 years. CFCs tend to stick around for approximately 150 years, so the difference is clear. Still, HCFCs do contribute to the greenhouse gas effect. Because they're still damaging to the Earth's ozone, the EPA mandated their phase out with the Clean Air Act of 2010. R-22 will be completely phased out by 2020 when production will stop entirely. Until then, production is being reduced in phases. 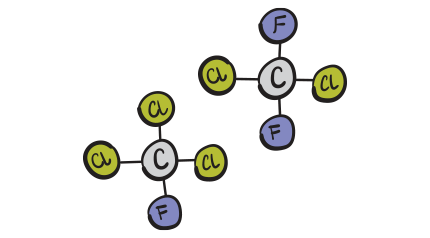 That leaves us with the newest class of refrigerants: hydrofluorocarbons (HFCs). 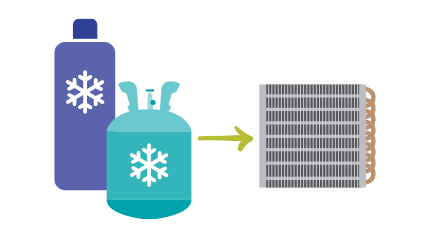 HFCs are the newest alternative refrigerants. They contain no chlorine (and are therefore safer for the environment), provide improved air quality, increase the reliability of your A/C, and as far as the homeowner is concerned, are just as efficient at cooling homes as R-22. If your air conditioner uses R-22 and develops a leak or needs another repair, your HVAC technician will likely recommend that your existing A/C unit be retrofitted to accept an alternative refrigerant, like Puron® (also known as R-410A). What does all of this mean for you and your home? Since the government mandated a 90% reduction in R-22 production by 2015, and a 99.5% reduction by 2020, it's going to become more and more expensive to top off your A/C's refrigerant with R-22 if a leak develops or another repair is needed to maintain your system. Air conditioners don't last forever, and your old unit will need service and repairs at some point. Keep reading to learn about the benefits of alternative refrigerants and your different options — when that inevitable repair becomes necessary, you'll already have all of the knowledge you need to make the most informed decisions. Now that you understand the basics of refrigerant and why it's such an important part of your home's air conditioning system, let's talk about the refrigerant you're most likely to find in your A/C if it was manufactured before 2013: R-22. If you aren't sure when your unit was manufactured, learn how to find that information here. R-22 is also known as Freon®-22 or HCFC-22 (which stands for hydrochlorofluorocarbon. 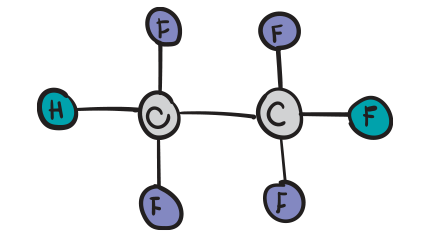 The full chemical name of this colorless gas is chlorodifluoromethane or difluoromonochloromethane, but you don't need to remember those terms to understand R-22 and how it works. 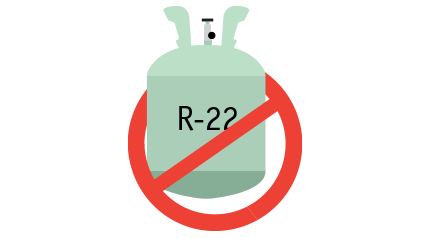 R-22 has a low boiling point, which makes it a very effective refrigerant. Since it's non-toxic and non-flammable it's also very safe to use in both residential and industrial settings. However, the chlorine molecules in R-22 deplete the Earth's ozone layer, and therefore this gas isn't safe for the environment. By 2020, R-22 won't be produced in or imported to the U.S. Production is being phased out, but usage isn't — many air conditioners still rely on R-22 to operate effectively. If your air conditioner uses R-22 you won't have to replace it and can continue to operate it, though the way it's repaired will be different. Even as the U.S. and other developed countries phase out the usage of R-22, its worldwide usage continues to rise. Citizens in rapidly growing countries like India and China are purchasing more air conditioning units than ever before, and this high demand combined with R-22's safety reputation make this refrigerant an attractive choice for consumers around the world. Even as global usage of R-22 rises, it's still important for developed countries like the U.S. to lead the way in adaptation of newer, more environmentally-friendly refrigerants. Once researchers realized the negative impacts of refrigerants like R-22, it was clear that alternative refrigerants needed to be used. Today's alternative refrigerants don't eat away at the Earth's ozone in the same way R-22 does, but it took us some time to adapt these more planet-friendly refrigerants. Humans have used different compounds as refrigerants throughout our modern history, and it all began in the late 1800s and early 1900s. The good news is that there are several alternatives to R-22 refrigerant that are readily available, less expensive and better for the environment. If your older air conditioning unit needs servicing you have several options for getting your home cool again, including retrofitting your air conditioning system to accept an alternative refrigerant or replacing it with a newer air conditioner that uses an alternative refrigerant. Note that your HVAC service technician may suggest a different refrigerant based on the specifics of your air conditioner and which refrigerants they can most easily purchase. 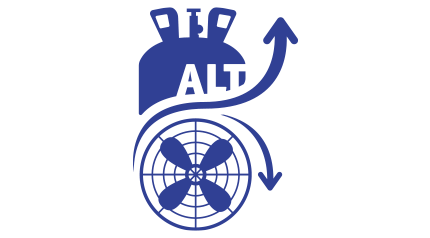 There are a wide number of alternative refrigerants available, and different HVAC supply stores carry different types of refrigerant. The experts will help you choose one that works best for your needs and for your existing air conditioning system. Whichever alternative they use, even if it's not listed here, can restore your air conditioner's functionality. Like Freon®, Puron® is also known by another name: R-410A. Nearly all new systems manufactured utilize R-410A. It is not compatible with older R-22 systems. This refrigerant was introduced in the 1990s as an alternative to ozone-damaging HCFCs. If you see an HVAC service technician with a pink colored cylinder, they're using R-410A. R-410A contains no chlorine, and therefore does not contribute to ozone depletion. It's also compatible with air conditioners that have higher SEER ratings (as compared to a system using R-22). Therefore, its usage also reduces power consumption in air conditioning units. Compatibility. It can be used with brass, steel, and copper tubing, which means this refrigerant can be used on a greater variety of systems. Note that R-410A can't be used with older air conditioners. Lower energy costs. This refrigerant functions at higher pressures than other refrigerants, which means you'll get cooler air faster. This ability to efficiently control the climate in your home could potentially help reduce your energy costs. Availability. R-410A is much easier to source than R-22, which is being phased out of usage. That means your air conditioner can be repaired faster if a breakdown occurs and you need to top off the refrigerant. Faster fixes. Older systems that use R-22 are generally more difficult and time-consuming to repair. When you have a newer air conditioner, service technicians can complete repairs at a faster pace. Peace and quiet. Because R-410A reduces power consumption, it also helps reduce the noise output of your air conditioner. Homeowners should note that R-410A does require the use of specific parts and components in their air conditioning system, because it operates at higher pressures than other refrigerants. MO99, or Freon® MO99, is an effective replacement for R-22. It matches R-22 in terms of efficiency and the amount of refrigerant needed in most air conditioners. It's also compatible with the most commonly used types of oil (oil is used in your air conditioner's compressor unit). Ease of retrofitting. Because of their similarities, retrofitting an R-22-based system to accept MO99 is a straightforward process. In most air conditioners, the retrofit simply requires recovery of the R-22, replacement of certain seals, the addition of MO99, and a restart. Faster fixes. MO99 is widely available and the retrofitting and refrigerant charging process is simple, so an HVAC service technician can fix your air conditioner quickly. A retrofitted system is also "future proofed", meaning future repairs will be able to be completed quickly. Better for the environment. As an alternative refrigerant to R-22, MO99 does not deplete the Earth's ozone layer. Availability. Like R-410A, MO99 is much easier to source than R-22. If your system uses MO99, your air conditioner can be repaired faster if a breakdown occurs and you need to top off the refrigerant. Homeowners with air conditioners manufactured before 2013 should note that retrofitting their system to accept MO99 does require some labor. To learn more about retrofitting an older A/C system, jump ahead to the, "How an Older Air Conditioner Gets Retrofitted For Alternative Refrigerants" section. Some alternative refrigerants are blended, which means they contain two or more types of refrigerant. R-421A is one such blend, and it combines R-125 and R-134A. Ease of retrofitting. Retrofitting an existing R-22 system to be compatible with R-421A is straightforward. If the system contains a filter dryer, that component may need to be replaced. No oil change needed. Most of the time, you don't need to change the oil used in the compressor when switching to R-421A. Faster fixes. R-421A is widely available and the retrofitting and refrigerant charging process is simple, so an HVAC service technician can fix your air conditioner quickly. Better for the environment. As an alternative refrigerant to R-22, R-421A does not deplete the Earth's ozone layer. R-421A can be "topped off". Once your air conditioner has been retrofitted to use R-421A, it can be directly added to your system. There's no need to remove the existing refrigerant before topping off (this also makes repairs easier). Homeowners with air conditioners manufactured before 2013 should note that retrofitting their system to accept R-421A does require some labor. To learn more about retrofitting an older A/C system, jump ahead to the, "How An Older Air Conditioner Gets Retrofitted For Alternative Refrigerants" section. R-427A (also known as Forane® 427A) is another environmentally safe alternative to R-22 that doesn't have a negative impact on the Earth's atmosphere. Depending on where your HVAC service technician gets their supplies, this could be the refrigerant that the supply house carries. Ease of retrofitting. Retrofitting an existing R-22 system to be compatible with R-427A is straightforward. If the system contains a filter dryer, that component may need to be replaced. Faster fixes. R-427A is widely available and the retrofitting and refrigerant charging process is simple (though slightly more complicated than R-427A or MO99, as the oils needed are different), so an HVAC service technician can fix your air conditioner quickly. Better for the environment. As an alternative refrigerant to R-22, R-427A does not deplete the Earth's ozone layer. Availability. 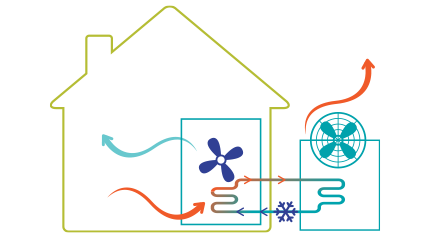 Unlike R-22, R-427A is widely used in residential cooling applications. That means your air conditioner can be repaired faster if a breakdown occurs and you need to top off the refrigerant. Homeowners with air conditioners manufactured before 2013 should note that retrofitting their system to accept R-427A does require some labor. To learn more about retrofitting an older A/C system, jump ahead to the, "How An Older Air Conditioner Gets Retrofitted For Alternative Refrigerants" section. *CA: 2-10 HBW Warranty of California, Inc.